Chinglish Alert! Here’s More About the Site | Chinglish Alert! By November 2014, David had amassed a massive Chinglish database of around 4,500 specimens, throughout China’s tourist traps, train stations, airports, highways, and shopping centres. Despite Beijing hosting the 2008 Olympics and Shanghai pulling off the 2010 Expo in style, what was curiously not in style were the many cases of Chinglish seen during these world-class events. Visitors in Beijing were being directed to signs on barriers over bridges which read Do not rely on safety, and entire vending machines in Shanghai bore the Chinglish name TAKE AWAY ME (which would be a tall order, probably even for Mike Tyson). In 2011, David authored a limited edition Chinese language book about the Chinglish phenomenon. In 2013, David hosted a year-long radio programme focusing on how to improve English in China. In late 2013 and early 2014, David worked closely with city authorities in Beijing on a brand-new guide teaching locals how to use standardised, Chinglish-free English. He has also lead groups of students in “smoking Chinglish out, and getting them running”, and has trained translators for international events in southeastern China. Yet in spite of David’s efforts, China still seems to be churning out Chinglish all the time. This is probably why this blog is here in the first place. 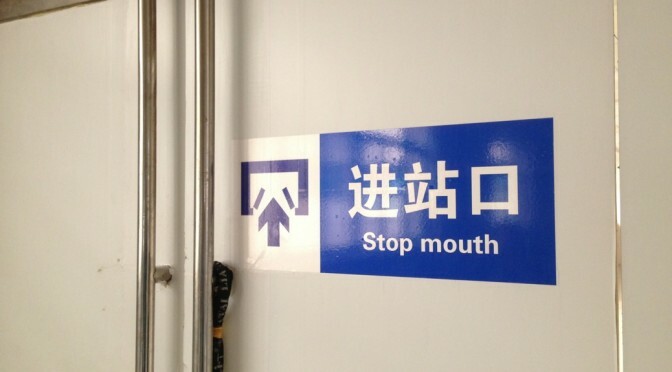 The blog is here to first explain why Chinglish is here (and how students can best rid themselves of frequently-made language errors in English here in China), and secondly, it also takes a deeper look at actual samples of Chinglish. It’s probably too easy just to post a funny pic and to leave people laughing, but David has also supplied recommended corrections. Some of us think Chinglish is cute — David agrees to the extent that a healthy guffaw is good every once in a while. But there’s also something to be said when a sign in Chinglish causes riders to miss their train at stations with bilingual signage in China! David’s mission: to keep on hunting down cases of Chinglish. He’s here to man the Chinglish Alert at all times. Let this be a place for learning, information — and probably a few laughs as well. This site incorporates content on Chinglish first published as of 2006 from David Feng’s former personal blog postings as well as as much content recoverable from totakenoticeofsafe.com and jionglish.com, the “previous two incarnations” of this Chinglish-related blog. * Upon a second check, the first digitised picture with signs in Chinglish was snapped already back in 2001, on a visit to Shanghai! Then I realized — something had to be done. This Chinglish phenomenon wasn’t dying; no, it was on the map and was alive and kicking already since 1992. I hate myself for losing a “comment card” from a restaurant near the Fragrant Hills which had some of the worst Chinglish — ever — on it. Beijing isn’t going anywhere with this Chinglish. Although hilarious for the expat community, it’s a huge embarrassment for Beijingers — and especially come 2008. Come to think of it, you may need to learn Chinglish as a second language by the time the Games are here in two years and counting. But why settle for second-class-citizen-rank Chinglish when proper English is the real answer? As the capital of a nation of 5,000 years behind and a few more millennia (a lot more, actually) to go, Beijing — and the rest of China — can settle for something better than Chinglish. What Beijing really needs is decent, proper English. I much prefer “CAREFUL SLIPPERY SLOPE” than this “THE SLIPPERY ARE VERY CRAFTY” stuff. This is my bit in helping Beijing out of its Chinglish mess. It may not be a lot, but it’s something, and I hope, a force for the good. By the way, if you’re in Beijing, check out that sign at the Howard Johnson Hotel near the central railway station. Quick — before they de-Chinglishify it.